MP4 Converters - Convert DVD Video to MP4 and watch on iPod. MP4 Converter 1.0 - convert popular video formats: *.avi, *.wmv, *.asf, *.asx, *.mpg, *.m1v, *.m2v, *.m2p, *.vob etc. to MP4 iPod video format. WinAVI 3GP/MP4/PSP/iPod Video Converter 3.1 - It can convert almost all video formats, for e.g., DivX, XviD, MOV, rm, rmvb, MPEG, VOB, DVD, WMV, AVI to iPod/PSP or other portable video device, MP4 player or smart phone. Super iPod Video Converter 3.5 - A professional and powerful video to iPod converter that supports a lot of video formats, with high quality and speed. Super DVD to iPod Converter 3.1.1 - Convert all kinds of DVD to iPod video with a single step, and enable to convert any segment of a DVD. ImTOO iPod Movie Converter 3.1 - This product offers convert movie to iPod, like AVI, MPEG, WMV, MOV, MP4, RM, RMVB, DivX, ASF, VOB, 3GP and etc. ImTOO DVD to iPod Suite 2.1.55.110 - Rip DVD to iPod video, and convert almost all popular video formats such as DVD, VCD, WMV, MPEG, and AVI to iPod movies. iPod Media Studio 1.0.0 - Convert videos as AVI, MPEG1, DivX, XVID, VOB, ASF on all drives and encode them to iPod. 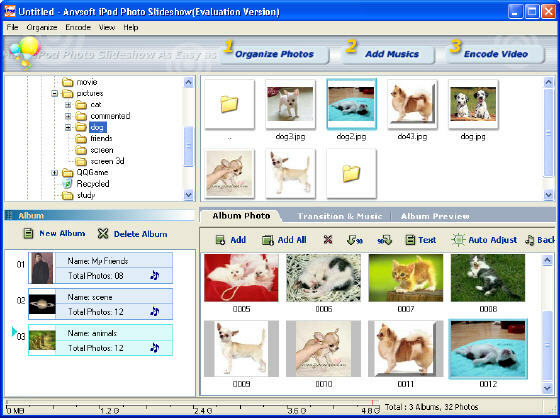 iPod Photo slideshow Maker 1.0 - Allows you to archive your favorite digital photos into iPod mp4 files with background music and up to 170 transition effects. Xilisoft DVD to iPod Suite - With Xilisoft DVD Ripper and Xilisoft iPod Video Converter in one, it can rip DVD to iPod, convert DVD and any other video and audio to ipod. Lenogo DVD Movie to iPod Video Converter 5.02 - Convert almost all kinds of DVD to iPod video (mp4) format with a speed faster than real time. 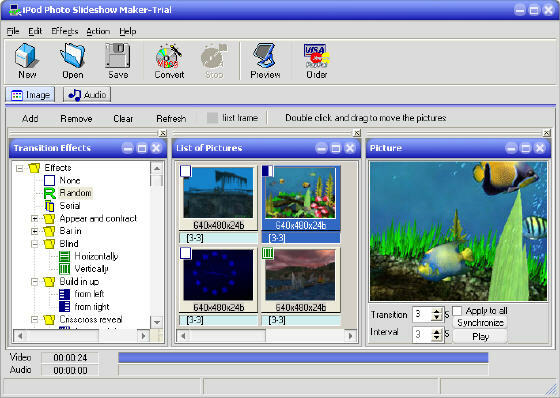 AnvSoft iPod Movie Maker 1.0 - Transfer your digital camcorder tapes and various video files into high quality movie playable on iPod. ImTOO DVD to MP4 Converter 4.0.35 - Rip and convert DVD to MP4 and DivX video format, and rip DVD to audio files: AAC, M4A, MP3. Movkit DVD to iPod Ripper 1.6 - Rip DVD and convert almost all kinds of DVD, such as DVD, VOB, IFO formats to iPod video (mp4) format, with a speed faster than real time. Xilisoft iPod Video Converter 3.1 - Convert all of the popular video formats like AVI, MPEG, WMV, MOV, MP4, RM, RMVB, DivX, ASF, VOB, 3GP, etc to iPod Video. Cucusoft iPod Movie/Video Converter 2.0 - Convert almost all video format, e.g. DivX, XviD, MOV, rm, rmvb, MPEG, VOB, DVD, WMV, AVI to iPod Movie / iPod Video format. Xilisoft DVD to iPod Converter 4.0.35 - Rip and convert DVD to iPod video MPEG-4 (MP4) formats and iPod audio formats including MP3, AAC, M4A. WinXMedia AVI/MPEG iPod Converter 2.35 - Convert AVI,DivX,XviD, MPEG4,MPEG1,MPEG2,WMV,ASF to iPod Video MP4 with AAC audio. AnvSoft Flash to iPod Converter 1.10 - Convert Macromedia Flash SWF files to MPEG-4 files including movie clips, action scripts and audio in the Flash movies.